Politician. Republican. Born: October 18, 1841, Rochester, Ohio. Died: June 20, 1894, Washington D.C. Served in U.S. House of Representatives, at-large and third District: March 4, 1883, to March 3, 1891. Served in U.S. Senate: January 1, 1892, to March 4, 1893. A U.S. representative and senator from Kansas, B. W. Perkins was born October 18, 1841, in Rochester, Ohio, and attended the local common schools and Knox College at Galesburg, Illinois. From 1860 to 1862 he prospected for gold in California and New Mexico and then served as a Union Army sergeant, adjutant, and captain during the Civil War. After the war Perkins studied law in Ottawa, Illinois, was admitted to the bar in 1867, and practiced law in Princeton, Indiana, before removing to Oswego, Labette County, Kansas, in 1869 where he served as county attorney and district judge (1870-1882). 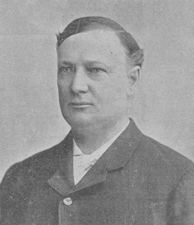 He became editor of the Oswego Register in 1873. Elected to the U. S. House of Representatives in 1882 (served, March 4, 1883-March 3, 1891), Perkins won reelection three times before being defeated by B. H. Clover in the first "Populist" election campaign of 1890. Perkins was appointed to fill the unexpired term of Senator Preston B. Plumb, who had died in office on December 21, 1891. After leaving office on March 3, 1893, Perkins remained in Washington, where he practiced law until his death on June 20, 1894.